36 Mardi Gras Doubloons. 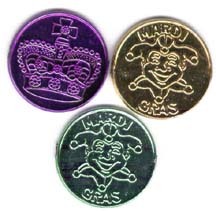 Plastic coins with purple, green or gold metallic finish (12 of each). One side has a jester face and the words "Mardi Gras." The other side is a crown. The coins are 1.5 inches wide.